No, don’t call me “Cassandra” (she had the curse of never being believed). Everyone knew my prophesy would be fulfilled! I’m doubtful we’ll get any real insights into this bizarre episode, at least in the short term, because Education Minister Peter Fassbender indicated that the investigation would focus on contract “procedures” rather than substance of the decision making process. As predicted the Fassbender investigation found that everything is hunky-dory in the Ministry. Read all about it here. 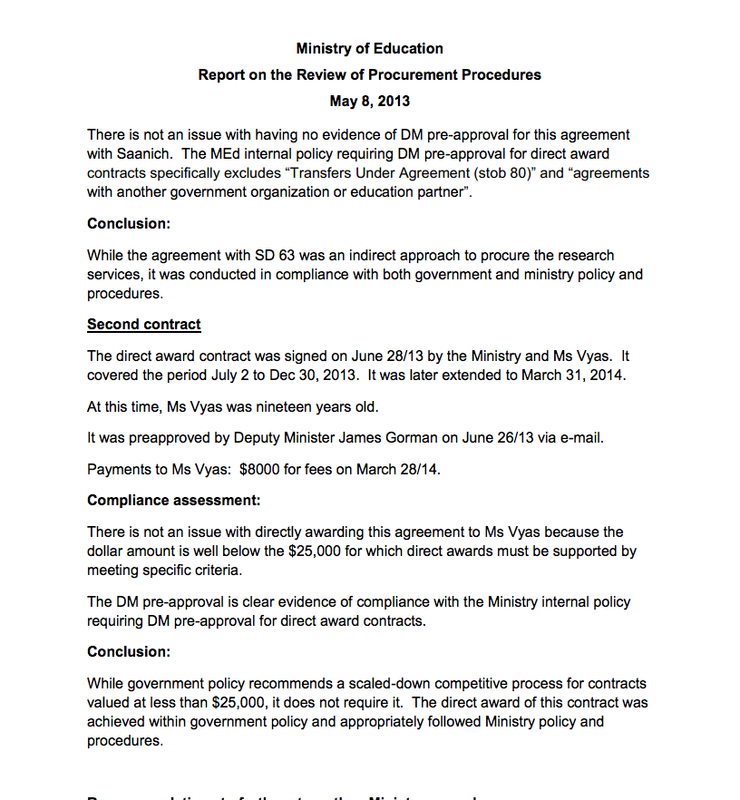 Fassbender’s, technical investigation into procedures of doling out single-source contracts, misses the larger point, which is the misguided judgment of education ministry staff in this case, particularly Rick Davis. Opting to CYA politically reinforces the point I have been hammering on since this imbroglio came to light last September, that is, the BC Ministry of Education actions demonstrate a profound lack of respect for the teaching profession, teacher education, and educational research in general. Page Three: Move along, there’s nothing to see here. 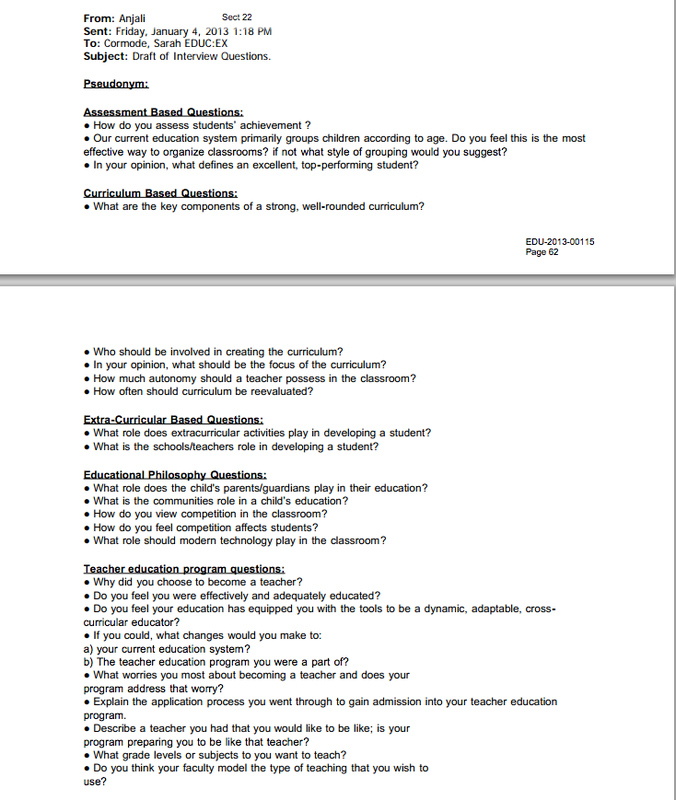 Or, how seriously does the BC Ministry of Education take research on teacher education? Jordan Bateman of the Canadian Taxpayers Federation of British Columbia, has been exploring the question of why the BC Ministry of Education would finance a teenager to conduct research on teacher education in Finland. 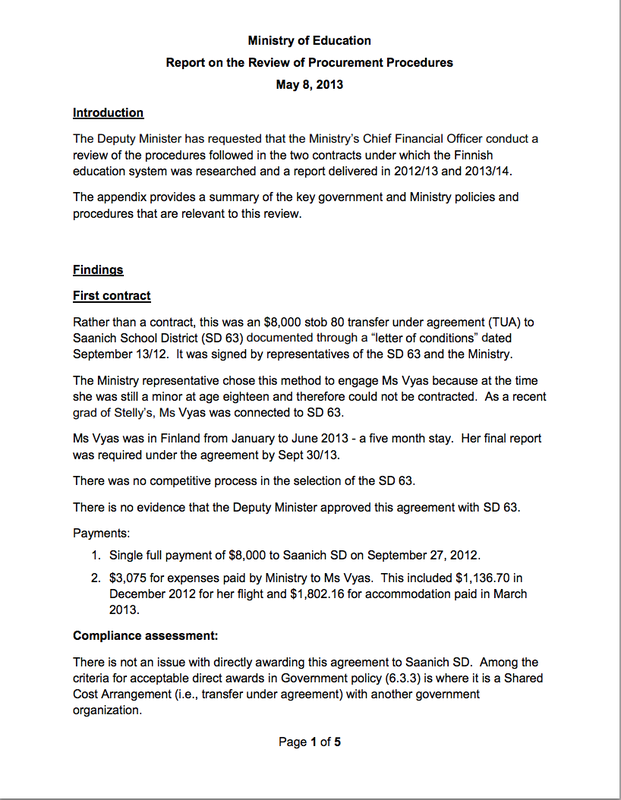 Through Freedom of Information requests the CFA collected and published 115 pages of communications among Rick Davis, Anjali Vyas, the high school grad who was funded to travel to Finland and write a report on teacher education, and other Ministry employees. These documents raise a number of questions about how the Ministry, and particularly “superintendent of achievement” Rick Davis makes decisions about doling out single source research contracts. These documents also represent events in ways that are inconsistency with the initial media reports about genesis of this project. (Read my previous posts on the subject here, here, and here. One thing that has been missing is Vyas’ final report to the Ministry. Bateman posted the report on the CTF website today. Read the report if you like. Or not, because as you might expect given the circumstances, there are no insights to be found in the report. Not even the “through a student’s eyes” perspective that Davis said was the point of the project. Instead, the report is a collection of general statements, with little or no data to illustrate or support the claims made. For example, there is exactly one quote from interviews conducted in Finland to go with one quote from a UVic student. There are a few references to and quotes from published works, but no reference list. But I’m not really interested in picking apart the report or judging the author. Rather, my question is what was Rick Davis and the BC Ministry of Education expecting? Did Davis really believe that funding a 10 month “study” of teacher education conducted by a high school grad would produce insights into the professional preparation of teachers? I’m at a loss to understand the rationale behind this debacle. Ignorance? Disrespect? A combo platter, with arrogance on the side? If it’s the first—that is, if the person in the role of “superintendent of achievement” for the province really did believe this was a good use of public funds and could produce useful insights into teacher education—then I respectfully suggest he shouldn’t have that job. There’s no arguing that Davis and the BC Ministry of Education have, by their actions in this case, illustrated a profound disrespect for teacher education and educational research in general. Perhaps merely an extension of the BC Liberals ongoing disrespect for professional educators. Hello British Columbians, stand by for news! If your memory needs some refreshing check out out the original Vancouver Sun story, Janet Steffenhagen’s blog post, and Where The Blog Has No Name posts (here and here) from when the story first broke. A big shoutout to Jordan Bateman, the BC Director of the Canadian Taxpayers Federation who today put the story back into play along with 115 pages of documents the CTF received as a result of a Freedom of Information Act request in an attempt to get to the bottom of why BC Liberals would give two research contracts to Anjali Vyas, an 18 year-old with no qualifications as a researcher, to spend 10 months conducting a “study” of teacher education practices at the University of Victoria and the University of Helsinki (with a 3 day stop over in London for a little holiday). 1. The origin stories don’t match. Anjali Vyas told the Sun that she was deejaying her friend’s wedding when she somehow met Davis and started talking education philosophy. “We instantly hit it off and he was so interested in my project,” Vyas said. 3. Rick Davis funnels the money to the Saanich school district and has them contract Anjali Vyas (pp. 54, 57 and 115). Further, he has the Teacher Regulation Branch pay for her airfare to Finland (pp. 50 and 89). 5. 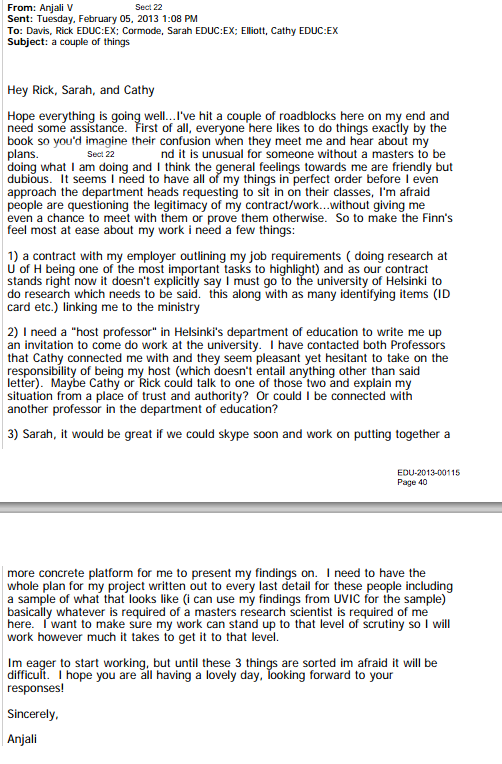 Claims that Anjali Vyas had a special connection to the University of Helsinki appear to be rubbish. Anjali told the Sun she was “obsessed” with the work of University of Helsinki professor Pasi Sahlberg, including his book Finnish Lessons: What can the world learn from educational change in Finland?. Amusingly, Rick Davis gave her that book (p. 96). Okay, so I understand that for Rick Davis, $16,000.00 for a little trip to Europe is really a drop in the bucket, in 2011 he racked up $77,657.00 in travel, more than any other BC government employee. What can we say about these questions? Well, they’re of the sort one might expect from an inquisitive person with an interest in education, and no knowledge of professional or scholarly literature. Completely unnecummbered by the history, theory, research or practice of teaching and teacher education. I’m sure Vylas (and Davis) might learn something from this endeavour, but there’s no other way to describe this scenario than as colossal waste of taxpayer’s money and, as I’ve pointed out before, an insult to the communities of education practitioners, researchers, and serious policymakers. Higher education is completely free. There are high standards for entry into teacher education programs and admissions are highly selective (about 10% of applicants are accepted). Teacher education programs are typically 5 years long and include study of the liberal arts, teaching subject speciality, theory and practice of teaching, including teaching students with disabilities. There are no “alternative” routes to teaching (no shortcuts, that means no Teach for Finland, no online degrees, no one without pedagogical training is allowed to teach). Finnish teachers and principals have autonomy to make educational decisions. The national curriculum is a guideline not a road map. Finnish teachers are not mere conduits for the transfer of information and skills dictated from the government. National student assessment is based upon a sampling model (not every student is tested) and there are no consequences from these assessments for students, teachers, principals, or schools. There is no standardized testing. And, no “value-added” models of teacher evaluation. Finnish schools have small class sizes. Finnish teachers and principals belong to unions. As a result of the above, teaching is highly respected profession in Finland. As Pasi Sahlberg writes in his book Finnish Lessons, Finnish schools promote the wellbeing of their students in a model that reflects many of the primary elements of John Dewey’s progressive approach to learning and teaching. My suggestion to Davis, Education Minister Peter Fassbender, and Premier Christy Clark is, if you’re serious about looking to Finland for ideas on education then stop the ongoing, obsessive attacks on the British Columbia Teachers Federation and start doing what is necessary to bring each of the above elements to reality in BC. In what is perhaps the most bizarre government sponsored “research” project ever in the history of British Columbia, the Ministry of Education has given two contracts to a 19 year old high grad to research teacher education in Finland and disseminate her findings to university deans in British Columbia, with the intent of transforming the professional preparation of teachers. Read the original news report here. The reporter wrote the story in the genre of “young person with passion providing a unique perspective to spark change” without irony, without critical perspective on the workings of government, or any consideration of what it means to conduct social research. But many in the chattering class who take education issues seriously, myself included, responded with criticism of the Rick Davis, a BC Superintendent of Achievement, who gave government contracts to support the teen’s “research” in Finland. What I find particularly interesting is the mini-backlash in the Twittersphere against folks who are critical of giving under the table contracts to unqualified teenagers to travel to Europe to conduct “research” on the professional preparation of teachers. Yes, people have perspectives on their experiences, but as heartfelt (or extensive) as they may be they are not inherently informative for research, policy, or practice. I celebrate and encourage a complicated conversation on social issues. Broad public dialogue on social issues is a key measure of the health of a democracy. But all perspectives are not equal. Participation in a public dialogue is important. Engage in the conversation. Share your ideas. The twist in this particular circumstance is that government has endorsed and financially backed a person with no distinctive qualifications (save having been a student in school) not to engage in a conversation, but to influence public policy on professional preparation of teachers. Would the critics of the critics support having random patients sent to Europe to research the professional preparation of physicians? A random selection of drivers who cross the Port Mann Bridge everyday sent to Europe to research professional preparation of engineers? No doubt that the years spent in a classroom give people a particular perspective on what teaching, education, and schooling are about. And I don’t deny the personally meaningful understandings that result from those long days and years. But, a student perspective is only a partial perspective on the complexity of what it means to teach. And, I would add that even the practice of classroom teaching itself is only a partial perspective on what is needed for effective professional preparation of teachers. Despite what some characterize as a “Mickey Mouse” discipline, teacher education is not merely 50 Nifty Ways to teach algebra, The Charter of Rights and Freedoms, or Pride and Prejudice. Professional teachers are not merely competent in disciplinary knowledge, but understand the epistemological structures of their disciplines and the contested nature of what is or isn’t taught in school. Professional teachers don’t merely have a caring attitude toward their students they understand human development and the ways in which social and economic inequalities impact on the daily experiences of their students. And, British Columbia Ministry of Education contracts with a high school grad to “research” teacher education in an effort to “spark change”? Rick Davis and the Ministry are either woefully ignorant of what it means to teach and what it means to prepare teachers or they just don’t care. And this has nothing to do with the teenage victim of their ignorance or indifference. Anjali Vyas, former DJ and graduate of Stelly’s Secondary on Vancouver Island, was contracted by the BC Ministry of Eduction to research teacher education practices in Finland for six months last year. Don’t get me wrong, while I’ve not read Vyas report, she seems like a very bright and motivated young woman and am sure that she and many other people who spent 13 years as public school students have perspectives on teacher education and teaching that are worthwhile. But, why would the BC Ministry of Education send a 19 year old high school grad to Finland to conduct research on a topic that many BC educators, teacher educators, and researchers are fully informed about? Rick Davis could have used Google Scholar to locate 66,400 results on “Finnish teacher education.” And spent a little time reading. Or perhaps he could have tapped some of the experienced teachers in the province to go over to Finland. Or push come to shove maybe he could have asked some of the researchers at any of BC’s several Faculties of Education to weigh in. Does he know that SFU has an Institute for Studies in Teacher Education that partners with University of Tampere, in Finland? Is he aware of any of several projects funded by the Social Science and Humanities Research Council to study education in Finland? Public education is a serious endeavour. There are thousands of professional educators working in classrooms and schools across BC who dedicated their professional lives to making public schools work for students, families, and communities across the province. And, there are hundreds of skilled and knowledgeable instructors and researchers working in BC’s teacher education institutions who are similarly dedicated and informed. Does Rick Davis and the BC Ministry of Education really believe a good-hearted, bright, but completely naive and inexperienced 19 year old high school grad can conduct research that provides insights into the transformation of teacher education in the province? If this is indicative of the approach government is using to construct the BC Education Plan, there’s little hope for the future of BC schools.